Here we go back to Indonesia. It is Saturday 19th of January and we have 9 days to spent in Sumatra. Well just a bit short to visit the whole Island. We land at the end of the afternoon at Medan, the main city of North Sumatra. 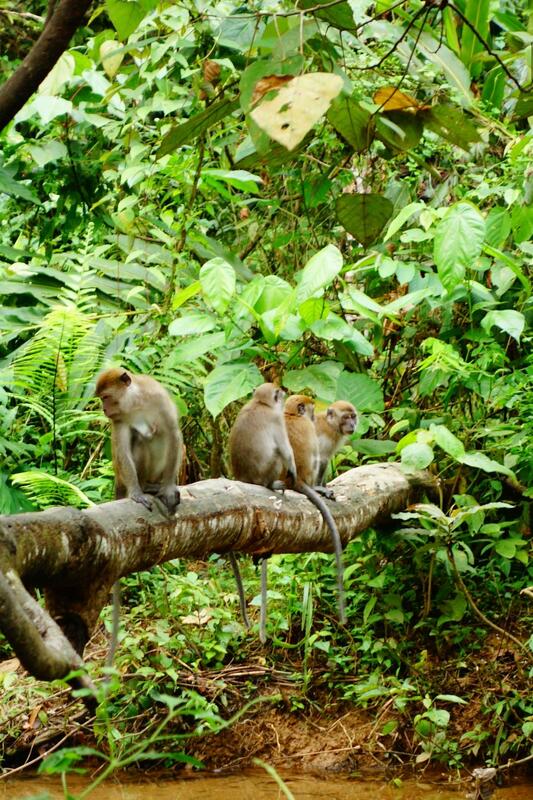 Our objective is to reach Bukit Lawang where we should go trekking in the jungle to meet with the local fauna and flora. Unfortunately for us, the bus to Bukit Lawang are already gone when we land. We spend therfore a night in Medan which is not a really weclomed city although its people are very warm, always asking about where you are from and what is the purpose of your visit. 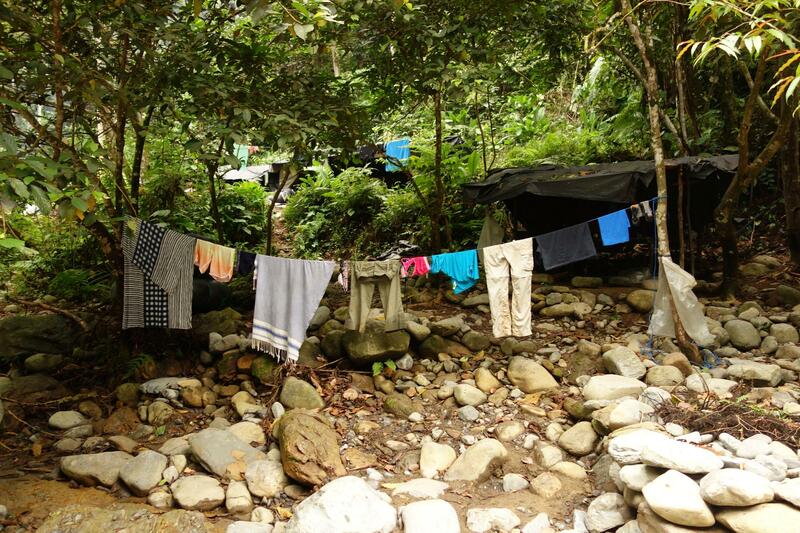 We arrive at Bukit Lawang under the rain (again), find a good budget backpacker (Rain Forest) and will spend the next day resting and visiting the village and its surroundings. Bukit Lawang is a Small village which organizes himself around two elements : Its river which crosses it and its jungle which surrounds it. In 2003, a fast flood wave devastated the village and killed 300 people who were sleeping. It was due mainly to illegal lodging of thousand of hundred of logs in a waterway in the mountains above the village, which came crashing down when the water pressure came too great. 10 years later, although there is no marks anymore of this event, the bitterness of some of its people is still here (as an example Hery, who will be our guide in the jungle, lost his father and had to carry his mother on his back while running into the mountain to avoid the water). 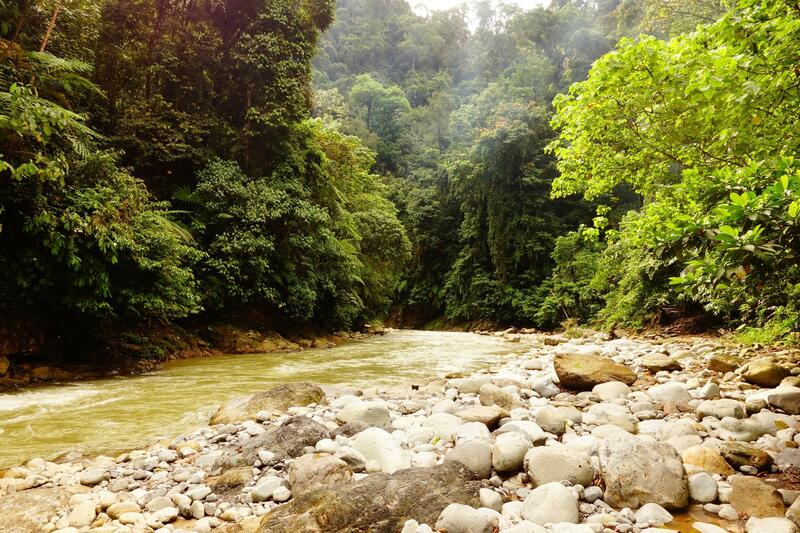 Photos galery of Bukit Lawang and its surroundings. 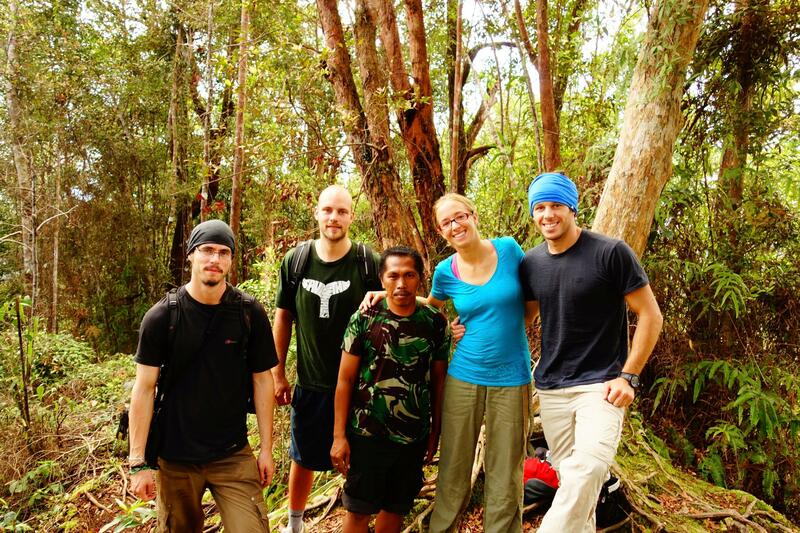 The first objective (Even when you travel, you need to setup objective) was to go trekking in the jungle. For how long, that’s a different story.. Indeed, Caroline wanted to go for 5 days while I was more keen for 2 days. After rough discussion, we agreed to go for 3 days and then moving to Lac Toba located at the south of Medan. We left Bukit Lawang along with Simon, a german traveller, Nick, an englishman engaged in various voluntary work accross the world, and Hery our guide. Hery is someone very humble and quiet, totally at the opposite of the other guide we have met. Nick and Simon are joining us just for two days, while we will continue for another day Caroline, Hery and myself. During the first day, we first meet the Thomas Leaf monkeys, some Orang-utan the white Gibbons and their brothers the white handed Gibbons. The white gibbons we found are so high in the tree it is almost impossible to get a good picture of them. Finally, their mates the macaques make the show pretty close to us as they were looking for food. Finally, a day full of emotion and unusual encounter. We haven’t felt we walked so much, even we have lost a few liters of water due to the hot and humid weather. 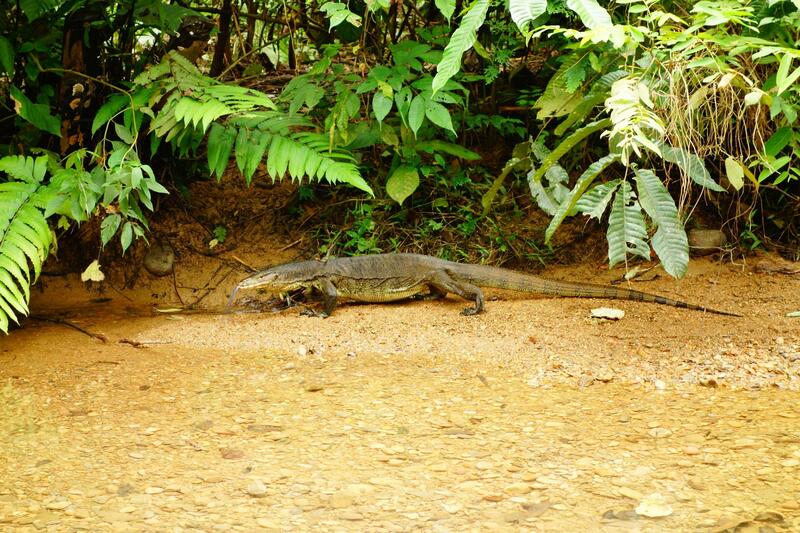 Please note that Bukit Lawang jungle is not flat. We spend the day going up hill than going down, and slip into the mud. Most of the monkeys are in the trees located at the top of the hills. So when you reach one and didn’t find any monkeys, you go down 200 to 300 meters very steep to reach the next hill. We were thinking a sled would be quite convenient. ça monte ou ça descend…. / it goes up or down? We arrive at the end of the day at our base camp just located near a waterfall which will be used as the shower of the day. Our porter/cooker is already there and offers us some tea, coffee and cakes. The beer and the water (from the the river) are kept fresh in the river bed. While our diner is getting cooked, we have a few visitors. 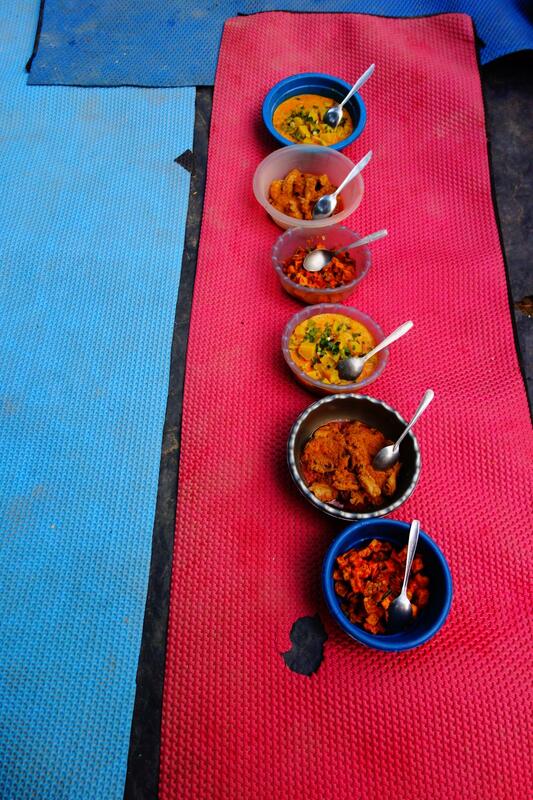 Diner is probably one of the best one we ever had in Indonesia… although it was cooked in the jungle on a wood fire.. The night was short… We will say that the sleeping mattress was thin and the noise of the rain pouring down on the roof was loud. The next morning, we start our journey at 9am. After a tough and steepy hill, we have the suprise and the luck (according to our guide) to see some black gibbons just above our heads. The youngest one keeps playing with us, maybe trying to get some food. He flies between the trees and make us believe it would be easy to do the same. Although the pictures are not easy to take. 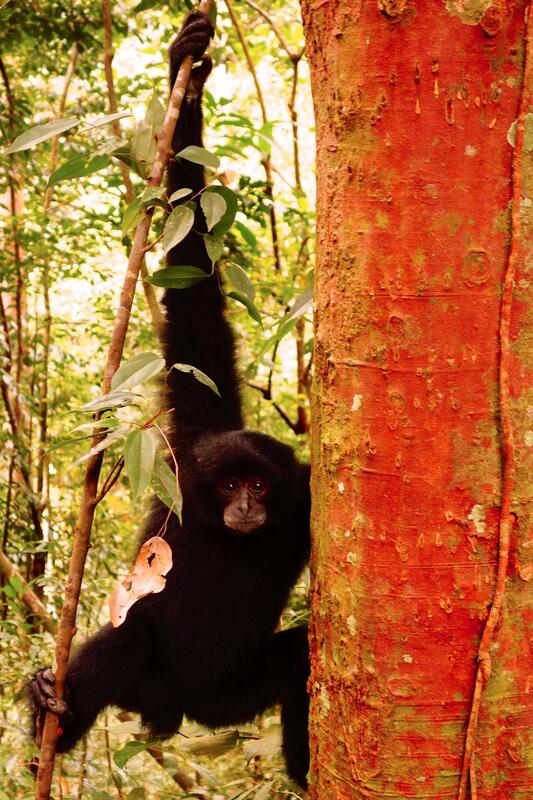 As opposed to the orang-outang very slow, the Young black gibbons just doesn’t stop moving : on the right, on the left, above our head, jump from one tree to another one, fall on the ground then run to the next tree. So funny animal. We can see his mother watching him while eating some tree leaves from the top. That will be it for the second day. 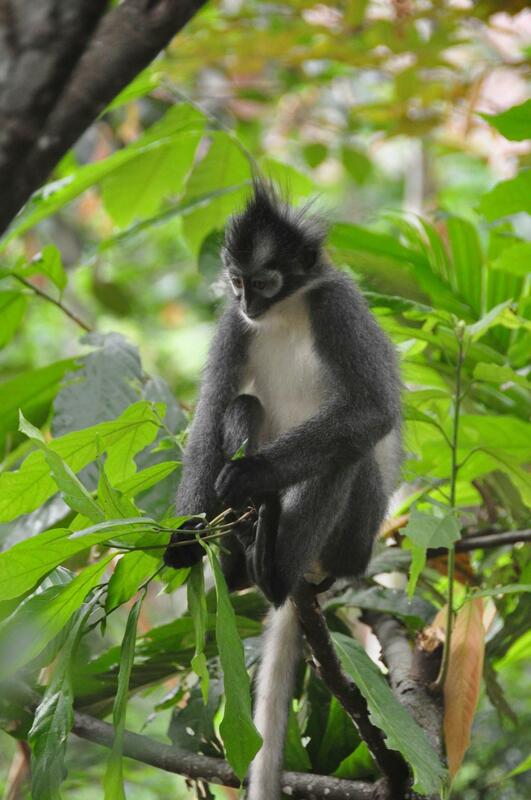 In the meantime, Simon and Nick have left us to go back to Bukit Lawang as they almost completed their second day. 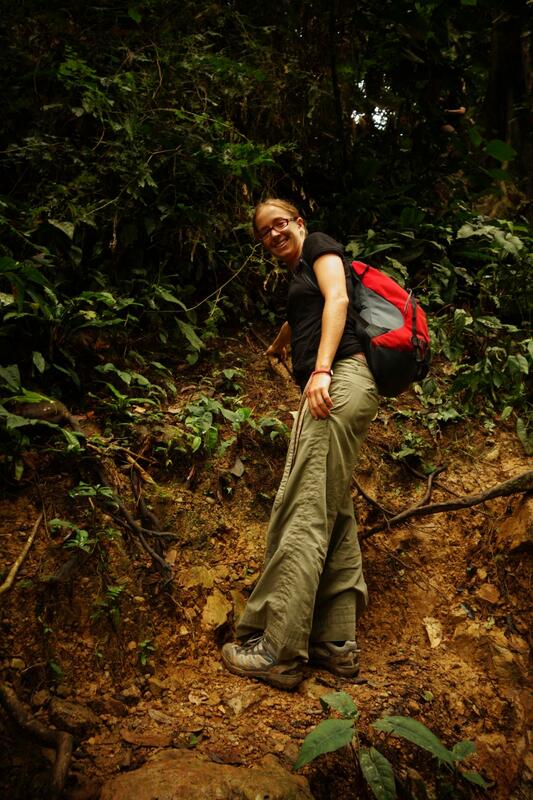 Caroline being a bit sick, we are taking our time to look for orang-outang and what the jungle has to offer. 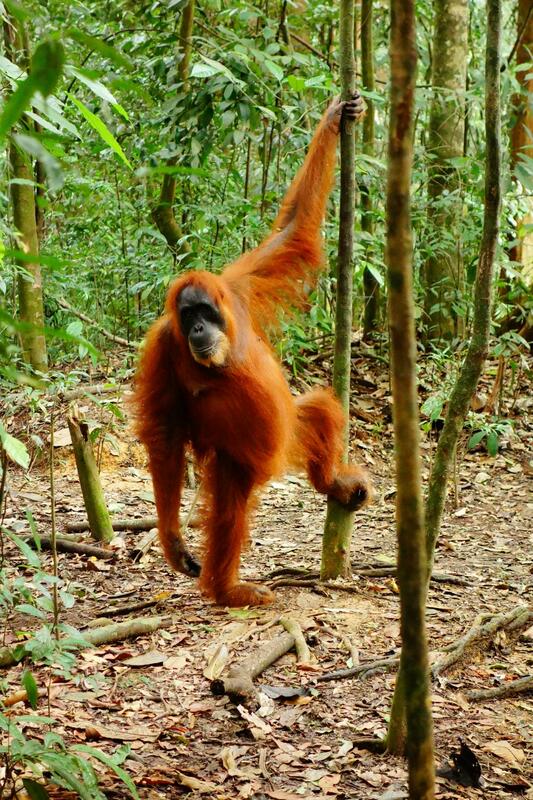 A lot of things to see, however we won’t meet any other orang-outang. 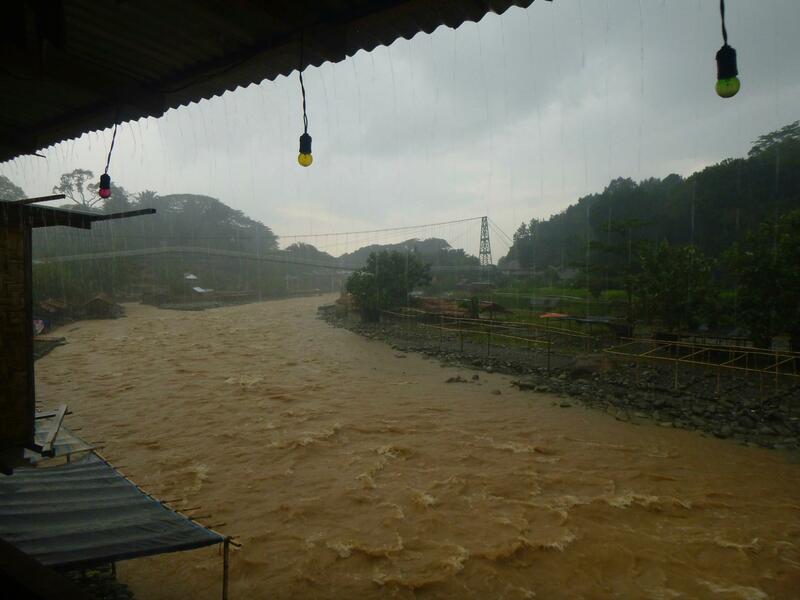 Our camp is located on the main river Borohoh which we will tube the next day to get back to Bukit Lawang. Same routine that the day before : shower in the river, tea and cakes then diner, followed by card game under the roof while rain pours down and then sleeping time. Now, a short gallery of macros photos. 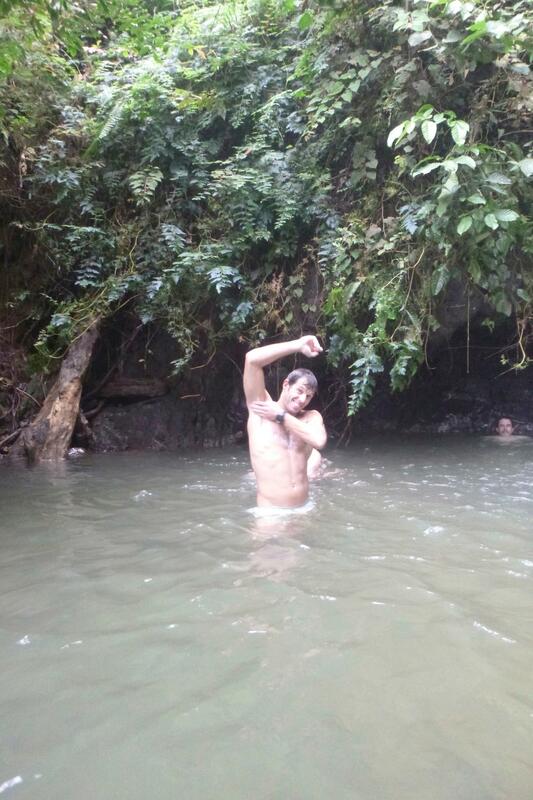 Not being able to see monkeys all the time, I have found some interesting little things in the jungle. The return timw is now. After a quick lunch, we embark onto our rafting boat made of 3 truck tubes. Two small ones where Hary sit down at the front to drive and the porter at the back to supervise the operations. Caroline and I sit on the large one between them and let the guys drive us. The descend lasts 45 min. Is it rafting or tubing, not sure. But the view of the jungle is amazing, we are going fast between the rocks that the guys try to avoid using their wood stick… Finally, we reach our hostel, the rain forest wet and alive. We are already Friday 25th (2 days before our departure from Sumatra) and decide to head to Lac Toba located a few hours south of Sumatra. We have a few more photos to upload and a video as well, but currently in Myanmar, internet connection are not fast enough to upload evertything. Stay in touch until the next post and don’t forget to go to www.jacquesandcaro.com to check out on the map where we exactly went. 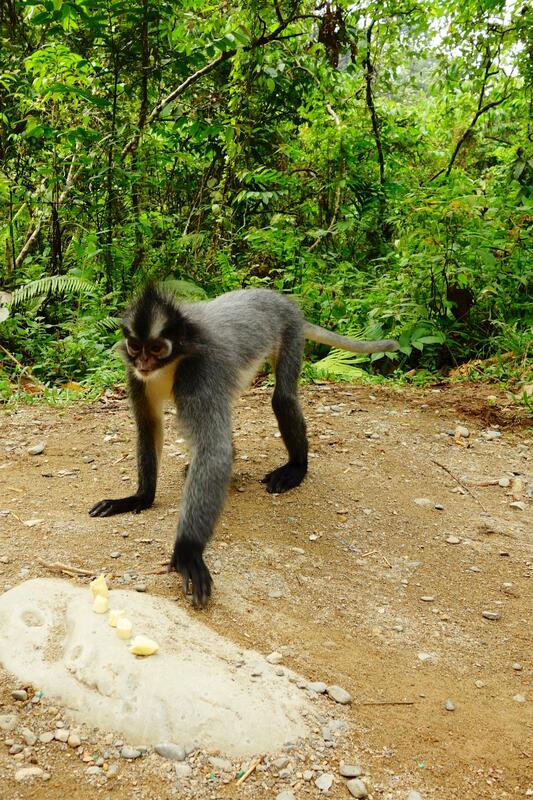 It is almost 2 months ago that I was there on the same spot in the jungle of Bukit Lawang. What a great adventure and nature overthere! 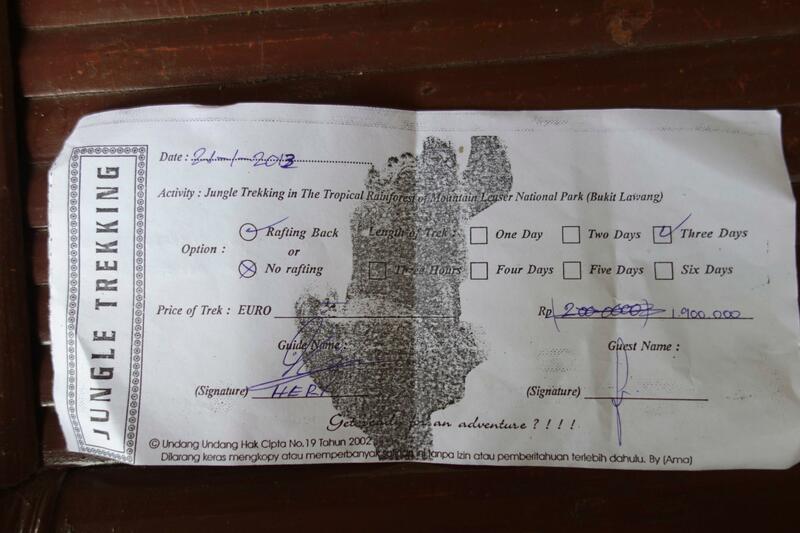 Thanks again for convincing me to visit bukit lawang and the rest of Indonesia. toujours un plaisir de vous lire!! The petite guyanaise family …..